World's Most Reputable Cities: Canada's Metros Rank Well Above U.S.
For the first time, Montreal places as Canada's most reputable city. A street in Old Montreal, seen at dusk. Montreal ranks as Canada's most reputable city in the latest rankings from the Reputation Institute. Among Canadian cities, Toronto and Vancouver have stolen the international spotlight in recent times, but a new survey finds Montreal is Canada's most reputable city — at least this year. According to the Reputation Institute, a management services firm that specializes in reputation measurement, Montreal is the world's 10th most reputable city, up from 14th place the year before. Toronto dropped to 13th place from 10th, while Vancouver — which often ranked in the top 10 as Canada's most reputable city in previous years — fell to 16th place. Despite the declines, "the reputation of all Canadian cities is still relatively strong compared to the rest of the world," said Stephen Hahn-Griffiths, the firm's chief reputation officer. "They are still viewed in a positive light." All three ranked higher than the U.S.'s highest-ranked city, San Francisco in 20th place. The survey asked more than 12,000 people living in the G8 countries — Canada, France, Germany, Italy, Japan, Russia, the U.K. and the U.S. — to rank cities according to numerous emotional and rational factors, to determine how people feel about cities and what they think of them. 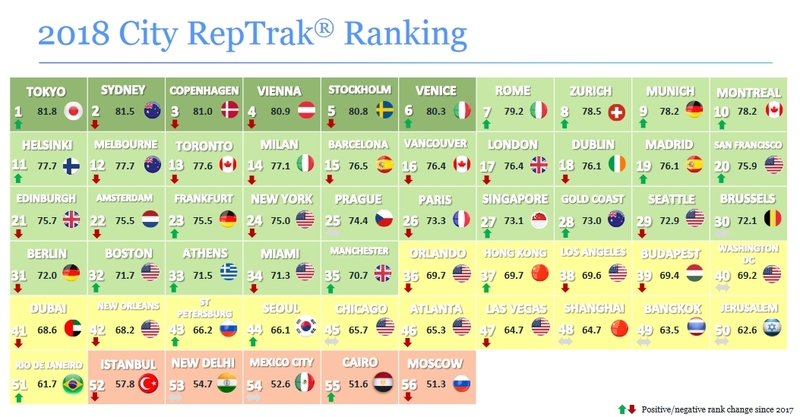 It found that Tokyo has the world's best reputation (up 11 spots in a year) while Moscow has the worst. Montreal saw a big boost to its reputation on issues of safety and security, while in Toronto, perceptions of safety are "on a downward trend," Hahn-Griffiths told HuffPost Canada. "Toronto is viewed as a less safe city than it used to be," he said, adding that this was just one factor that contributed to the city's decline on the rankings. The survey was carried out in March and April of this year, before the series of violent incidents that hit Toronto this summer. The survey also found Toronto and Vancouver are falling on perceptions of cultural diversity and entertainment. Hahn-Griffiths suggested they step up their game in promoting their cultural attributes. "They should be asking, 'What can we do to create more excitement around our cultural diversity?'" Hahn-Griffiths said. The cities also declined on perceptions of public policy, particularly the sorts of progressive policies seen in major cities. Toronto and Vancouver are perceived as being "a tad more ordinary, and perhaps a little less progressive in terms of their policy agenda" than they used to be, Hahn-Griffiths said. Overall, Canadian cities are "stacked with some very stiff competition" like London and Tokyo, but they still hold their own, Hahn-Griffiths said. The five top-ranking cities all have one thing in common, he added: "Governors or mayors who are seen as ... highly regarded leaders." Tokyo's first place ranking is the result of cultural and political reforms taken years ago that have finally paid off, Hahn-Griffiths said. Moscow's last-place ranking is due to global perceptions that it is "a dark, dank place where people aren't happy to live." But Russians themselves rate Moscow very highly, giving the city a much higher score than do people from other countries. "Russians think highly of their own cities," the Reputation Institute noted in its report. To qualify for the list, a city has to be among the largest in its country, by population and economy, and it must be recognizable to at least 30 per cent of respondents around the world. Montreal, Toronto and Vancouver were the only Canadian cities considered among 56 cities. The survey assigns each city an "emotional score" (how people feel about it) and a "rational score" (how people think about it). It asks questions that fall under three broad categories: "Advanced economy," "appealing environment" and "effective government."